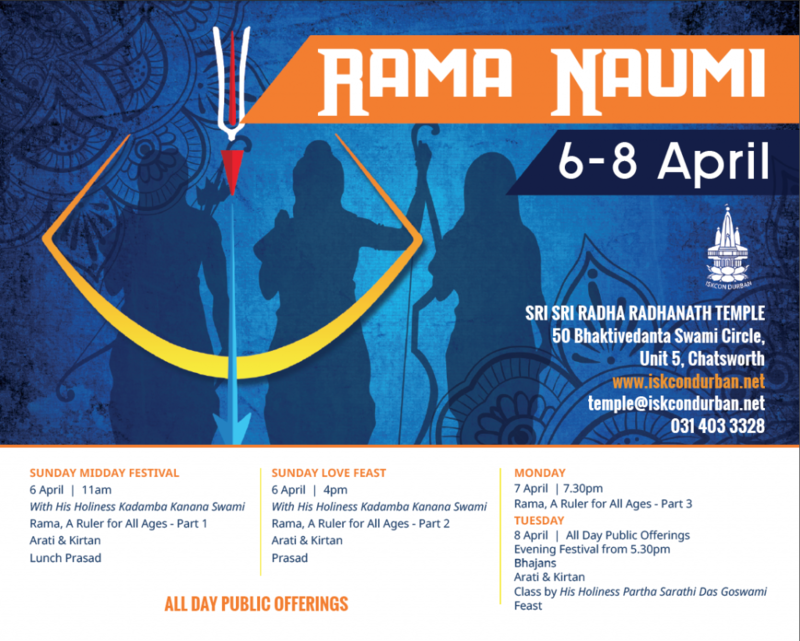 Next Tuesday, 8 April is Rama Naumi, the appearance anniversary of Lord Ramachandra, who is one of most prominent incarnations of Lord Krishna. Leading up to Rama Naumi, we will host a nightly program starting at 7pm from tomorrow, Wednesday 2 April until Tuesday 8 April. Classes and narrations will be based on the Bhagavat Purana (Srimad Bhagavatam), Canto 9, Chapters 10 and 11. You are warmly invited to come every evening over the next week and absorb your mind Lord Ramachandra’s glories. Please find attached details of special events beginning from Sunday, 6 April at midday. We are excited to have with the association of His Holiness Partha Sarathi Das Goswami and His Holiness Kadamba Kanana Swami over the Rama Naumi festival. To honour of Lord Ramachandra you can fast on Tuesday until sunset. Hare Krishna. Please accept my best wishes. At this week’s Sunday programme at the Radha Radhanath Temple, His Holiness Bhakti Caitanya Swami presented a deep and insightful class that highlighted the best method to progress in spiritual life. The essence of spiritual life is to render service. In that position one experiences sublime happiness. In Krishna consciousness we uncover an interesting phenomenon: that there are varying degrees of perfection—perfect, more perfect, and most perfect. Bhakti Caitanya Maharaj explained that while serving Lord Krishna is a perfect process to progress in spiritual life, the most perfect method to please Lord Krishna and to progress is to serve Krishna’s devotees. There is no other process that will allow a devotee to develop taste and attraction for Krishna as swiftly or effectively as service to the devotees. This process is so relishable that Lord Krishna always hankers for opportunities to serve His devotees and He emphatically declares that being a servant of His devotee, is a higher position than being His direct servant. The more I reflected on Maharaj’s masterful class, the more I marveled at how Srila Prabhupada designed ISKCON. This is an institution that provides limitless opportunities and facilities to serve devotees. All we have to do to be eligible for this highest process and highest spiritual experience is simply to remain in ISKCON, remain loyal to Srila Prabhupada’s teachings, and take advantage of all his arrangements. I hope this has stimulated your appetite to uncover the glories of serving devotees. Please hear Maharaj’s class at: https://soundcloud.com/durbankrishna/30-03-2014-sunday-love-feast. Finally, we celebrated Snana Yatra at New Jagannath Puri Temple on Sunday. Bhakti Caitanya Swami also spoke there and encourage everyone to serve Lord Jagannath in a personal capacity. He made wonderful suggestions including sending Lord Jagannath a “Get Well” card that we can buy or make.